I'm a proud Mama again! This is Bea! She's my new quilting machine (a BabyLock Tiara). I'm still setting her up and reading the manual, but I cannot WAIT to starting quilting those 5 quilts I basted last week! Also, remember this quilt? Yeah, my 100"x100" AMH beauty? I'm so excited to have Bea because now I don't have to send my pretty quilt off for quilting, I can do it myself! Oh wow! Look at you. That's fantastic. I'll show my ignorance - is this machine just for quilting, or for piecing too? Oh I can't wait to see what you can do with that bad boy! ANd I LOVE your AMH quilt! I'm working on a simple patchwork quilt using Field Study and posted about it just this morning! 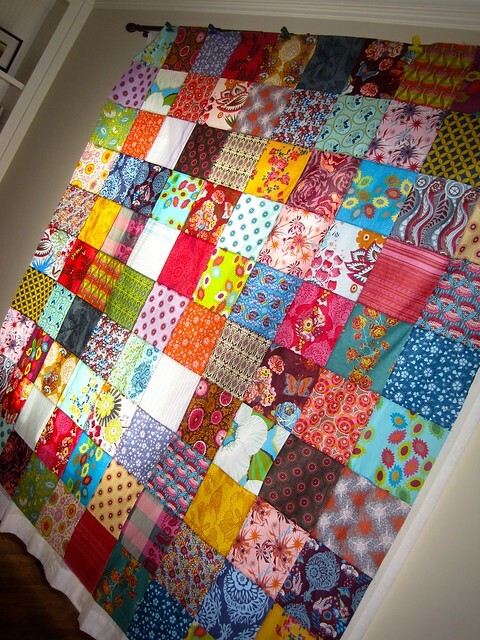 :) Her prints lend themselves so well to being displayed in simple patchwork form. Can't wait to see yours finished. Woo hoo! No WONDER you've been on a basting binge! Have fun! oh fun... i want to come play with bea sometime!! I am so very, very jealous. And happy for you! I am sew jealous! I played with this machine at my LQS. Drooling! Have lots and lots of fun with your new baby! Pretty sure I need one of those too!!!! She looks amazing - have fun getting to know her and quilting that gorgeous AMH quilt. I have a couple of questions. Does this machine come with e frame? How long is the arm? It's really cool. I like the big work surface. How big is that? Your AMH quilt is gorgeous. Can't wait to see it finished. I used your spray basting without pins or tape method today. I usually tape to the wood floor, but I just tried your way on the rug and it worked great. Thanks! I've never seen or heard of this machine. Must investigate! Have fun! I'm embarrassed to say that I've also not heard of this machine and will have to go and investigate. But I have an important question: what's the maximum size quilt size you'd consider quilting with a normal machine? The main reason I ask is that I've got to use mine to quilt a 200x210cm quilt that I've just basted and I think I'm biting off more than I can chew! Lucky you! That looks like it will be absolutely fantastic to quilt with -- look at all that space! oh happy day! how is she treating you?? You will LOVE this machine! 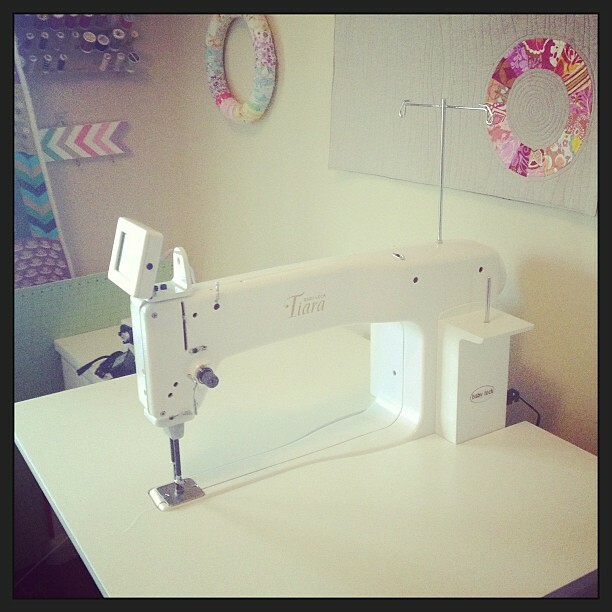 I love my longarm and can't believe that I didn't get it sooner.